Laus - thanoscardgamess jimdo page! This game from Germany is related to Ramsch. There are effectively five suits: jacks (trumps), clubs, spades, hearts, diamonds. Certain cards carry penalty points, and the object of the game is to avoid taking tricks containing those cards. Taking queens in tricks has an additional effect. The club, spade and heart queens carry extra special penalties which swamp the normal card points above, but these can be neutralized by taking the diamond queen. 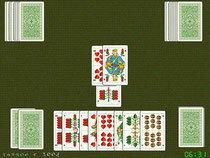 A trick is won by the highest jack in it - or if no jacks are played, it is won by the highest card of the suit led. The winner of each trick leads to the next. You can play the four player game and the three-player game. You play it with French-suited or German-suited card decks.